Malvin lives in Adelaide, South Australia, and has just announced that he now has his own website! Check out www.malvinartley.com/. He also works in the engineering trades and sends out periodic emails about astrological happenings and developments. Click here to subscribe to Malvin's periodic letters. Malvin Artley, our regular esoteric commentator, presents the Sagittarius Solar Festival, 2010, at the Full Moon in Gemini. This is Sagittarius's Full Moon, as the Moon is full in the sign opposing the Sun, and in this case is a total Lunar Eclipse. The Full Moon of Sagittarius (the Full Moon at Gemini 29º 21') takes place on the 21st of December 2010 at around 08:18 UT (GMT). This is followed by a Solar Eclipse at the New Moon in Capricorn on the 4th of January, which Malvin also examines with a view to its esoteric significance. I hope you are all ready for the holidays, if you celebrate holidays over this period. It is going to be a busy season for me, thankfully, as I have work, but for this year that is a good thing. Ordinarily I would want the time off. Well, my little experiment with the new format for these letters drew a resounding sigh and a few complaints, so as you can see I have reverted to the old format. Why fix what isn't broken, right? It has been a wild December so far here in Oz, as well as in much of the rest of the world, some places freezing, other places flooded. Some of the poor farmers in the flood-affected parts of this country have had their crops washed away, with many of them reporting they would have been the best yields in years. We pray for rain and then get far more than we wished for. The resulting sting in the food budget later on will hurt. Europe and the US are shivering and digging out from snow. There are fires in Israel, the worst in its history, and large-scale financial trouble in parts of the EU. The US economy is stagnant. With all of this going on and then some it hardly seems a time to be feeling celebratory, and we are told things could be far worse. The need for a strong sense of community and help is needed acutely in the world. Yet, it is this very sense of hardship that tends to draw out the best in us and force us to rethink our lives, searching for substance and meaning rather than comfort. The time for a more adventurous and far-reaching mindset has arrived. What I am saying here may seem platitudinous and somewhat insensitive given what many people are experiencing, but I say these things to help, and to indicate what I see happening, which is the purpose of these letters, and to see what is going on underneath the outer events we are experiencing. One of the great gifts we are being given in the world now is an open door to spiritual opportunity—a vision of how things could be so much better in our lives than they are—not to say that anyone's life is bad. However, to say things could be better is an understatement. People are struggling these days. No doubt about it. In that, though, the seeds of future freedoms are sprouting. We live in bold and daring times, the very thing the enlightened ones wait for and watch regarding our responses. What will come of this period are a few people of decisive action and inner strength, some of whom will carry us forward as a society, others who will seek to wreck the old orders, and those people will all have in common the ability to speak to the masses and motivate them to their causes. I was recently in the States and the frustration level there is palpable. The soil for change is fertile. It is the same in many parts of the world, especially in Europe and the Middle East. It would be really nice if I could give a cheery message for the holidays, but I do not see a lot of cheer around. Instead, I hear constantly people saying they feel something is about to happen, but they do not know what. There is a definite sense of excitement underlying what people are saying if one digs a little, and it is definitely my sense that we are all headed toward an outcome that will ultimately be much better for us all, but the changes leading up to that may be anything but happy in the interim. What is really happening at the moment is that we are being shown what is of real value in life, and that has nothing to do with the material side of things. Something new is about to emerge. Pluto is tearing down the old Capricornian structures at the moment in preparation for that, but the real revelation and emergence will only come when Uranus moves squarely into Aries from March 2011 onwards. Yes, something is about to happen, both individually and collectively, and what that 'something' is will be revealed to us over the next year or two. It will be a good thing! If you want me to tell you what I think is going to happen it is pointless to do so. What that 'something' will be will vary according to each person's or society's needs. Every person's or group's makeup, karma and chart is different. However, I do have a vision for this world that is somewhat at odds with many of the more severe or dramatic writings or forecasts we have seen in the media in recent years. At the other side of all this change I see a more settled world, and one in which there is not so nearly the focus on the power games and material pursuits that we see in the world now. We are being forced back on ourselves and made to look within. If that means we have to suffer privation to get us there, then life has a way of doing that for us. However, if we set our goal high, 'high' in the sense of spiritual focus, then life has a way of taking care of us that can be quite surprising at times. Vision is what we need now, and the ability to follow through with it. As we have been in the Sagittarian phase of the year since the end of November, we should pause to reflect upon 'vision' and what it means to us, for that is the hallmark of the sign. Sagittarians are visionaries, and they have a lot to teach us about life experience and what it means to hold to a vision in life. As stated, Sagittarius is ever the sign of the visionary and person forever on the move. 'Limitation' is not in a Sagittarian's vocabulary, and they are always testing the limits of things and people, holding out their view of what things should be, acting on that, and then learning the hard lessons that come about from the disparities between one's hoped and projected outcomes and the realities of life and people. The term 'projected outcome' is one which is at the heart and soul of the Sagittarius experience. Sagittarius is the archer, firing the arrow of their desire and aspiration toward some perceived goal and then having to walk the path between themselves and their flung arrow. Sometimes the path between arrow and archer is smooth and easily attainable. Other times a veritable chasm can yawn between the archer and the arrow, wherein they have to ascend to the depths of the chasm and then make the hard ascent the other side to retrieve it—or perhaps just write off the arrow altogether. Desire is the big lesson and burning ground for the Sagittarian. The goals of the worldly type of the sign are always based upon some temporal outcome, full of the fires of passion and ambition and very often tinged with a sense of sensationalism or great drama, for Jupiter is the ruler of the sign in its worldly phase. Jupiter, in a manner speaking, does not know how to do things in a moderated fashion and every Sagittarian has to learn the way of moderation in the earlier part of their life, if they ever learn it. Through experience, though, wisdom dawns, and the Sagittarian type will eventually become imbued with a sort of down-to-earth worldly wisdom as a result of their travels and trials. All those trials eventually lead the Sagittarian type to an inescapable conclusion at some point in the soul's journey, however—that temporal wishes and goals ultimately only lead to dissatisfaction. Every worldly goal attained eventually loses its lustre and a new goal must be sought, lest the Sagittarian's spirit wither under the newfound limitations of what once seemed like it should be a good idea. Depression can be the result of this dawning sense of the futility at the pursuit of worldly gain, and that is fortunate time indeed for the Sagittarian type, for it marks the time in their soul history wherein there is a reorientation on the path and the goals increasingly become inner, spiritual goals rather than worldly ones. Then, the problem for the type is not so much the goal as it is where to focus, and there is then a sense of 'wandering in the void', that life in this world is empty —and the truth of things then begins to dawn in their mind. Once it is realized by the Sagittarian that worldly ambition and the pursuit of pleasure is not the way, then the life of the path of higher knowledge becomes their way. Sagittarians are naturals at study when they enter this phase. Knowledge and liberation from suffering and the depression that can dog them become a burning quest and the full phase of the Earth's rulership of the sign then takes over, making the type the traveller far and wide in the search of that balm for the soul—the Holy Grail, if you will—that will bring their liberation and ultimate wisdom. At that time a curious phenomenon takes place in the Sagittarian psyche, and they learn that they have to mentally focus, and that the mind is the true battleground, not what they desired. At that point, then, the Sagittarian begins to learn to meditate in earnest. All worldly experience is shunned, as is all worldly knowledge and wisdom, and the technique of what is called vipassana, or 'meditation with insight' becomes the key tool of the Sagittarian disciple, the aim being self-transformation through self-analysis and meditation on the true nature of reality. I will cast out Wisdom and reject Learning. My thoughts shall wander in the Great Void. Will never bring my heart to rest. But my joy is as though I possessed a kingdom. To the four frontiers men join in my refrain. For those readers versed in Buddhist tenets and philosophy the preceding poem will be instantly recognized as a celebration of meditation on emptiness, the universal antidote to all mental suffering and afflictions. However, this poem is also a uniquely Sagittarian expression. Sagittarius typically wants to be free of any restriction, and hard earthly experience inevitably brings the Sagittarius type to the conclusion that worldly wisdom and learning only lead one to one set of limitations after another, whereas 'wandering in the Great Void' – meditation on emptiness – ultimately brings happiness (and bliss in the end) since all worldly matters and ideals are transcended when the truth of their nature finally stands revealed —that they are in fact and indeed empty of any inherent existence of their own and are the results of cause and effect and interdependence. It is never the Sagittarian way to bear the chest, loudly repent of wrongs done and wring the hands in regret. No, the sooner they can be rid of such feelings the better, in their mind. There is nothing more depressing to the Sagittarian than regrets. The 'main game' for any Sagittarian type is a total realization of freedom. In the worldly types this results in a devil-may-care attitude and flippant irresponsibility, whereas in the disciple and initiate the sign produces great meditative practitioners and spiritual teachers. The task before every Sagittarian type is to learn to focus the mind in a meaningful manner, i.e., to 'cast the eye upward', as it were, and penetrate deeply into the meaning of every experience. It is one of the signs wherein orientation becomes of supreme importance if the life is to be a success from a spiritual perspective. There is a deeper meaning to Sagittarius, though, which lies at the heart of the symbol for the sign (the archer on a horse) and is connected with the processes of purification and initiation, and that deeper meaning is veiled in the action of Mars. Mars in connection with Sagittarius governs the process of purification, the final goal being the emancipation of the disciple from the thrall of the lunar vehicles (the bodies, or aggregates) and it is the ultimate ruler of the sign form the human perspective. There is a lot of a technical nature that could be added here, but the result of that process of purification can best be summed up in the myth of Pegasus and Bellerophon, which is well worth a read. The horse of Sagittarius becomes Pegasus when the path of purification is taken up in earnest. 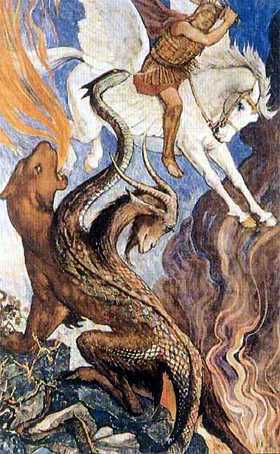 When the Medusa, the result of vanity (self-interest or self-grasping), is slain, its blood (Mars) soaking into the earth (the esoteric ruler of the sign), Pegasus arises—which actually represents the awakened subtle fires of the human system, i.e. kundalini, gtum mo, etc.—ascending eventually into the heavens, yet another symbol of the Great Void. Pegasus was said to be the produce of Medusa's blood, earth and sea foam (Mars, the Earth and the astral plane, being the main realm of Sagittarian experience). Bellerophon is, of course, the disciple and would-be initiate—but he has a problem to overcome, lest he fall victim to himself—his own arrogance in knowing he is of the divine and pride in his achievements. Arrogance is ever the downfall of the Sagittarius type, and is born of the lower side of Jupiter. Hubris can be a real problem on the path and the tendency for many people who take up spiritual disciplines is to think themselves as somehow above or better than others. This hubris can be either very subtle or overt, but the end result is always the same, which is a fall from grace and, in the case of Bellerophon, results in figurative lameness and blindness on the path. Bellerophon, after his fall from Pegasus and his resulting infirmity, was said to have wandered alone through the Aleian field (a symbol for the burning ground, or purification), 'avoiding the paths of men, and died miserably'. His pride arose from the fact that he triumphed over every trial put before him, thinking himself a favourite of the gods. It was actually the god Jupiter that sent a gadfly to cause Pegasus to throw Bellerophon from his back. There is so much symbolism that could be expanded upon here, but suffice to say that what is being described in the myth of Bellerophon is really a common experience on the path of purification if one is not vigilant about one's ego. Ego is largely a product of kama-manas (desire mind) and is that which gives rise to our sense of separate, self-indulgent existence. In its lower aspects it gives birth to the nine heads of the Hydra (see the Scorpio letter for this year), but in its highest aspect gives a vehicle through which human evolution proceeds until such time as the spiritual life is begun in earnest. Pride, as one of the seven deadly sins, is one of the worst manifestations of what Buddhists call self-cherishing, and it must be routed out at all costs if one is to attain any lasting sense of joy and realization of the truth of existence. It is a very subtle thing in the final analysis, but it has been the cause of the downfall of many a disciple through the ages. It may be of interest to note that the first task Bellerophon was given was the slaying of the Chimæra, a monster composed of a lioness' head and body, a goat's head rising from the center of her spine and with the head of a serpent gracing the end of the tail. This was a monster of the fire-breathing sort, very fast and powerful. The symbolism of the constituents would not be lost on astrologers and esotericists: the lioness representing pride, ego and Leo; the goat's head representing ambition and Capricorn; and the serpent's head representing deception, hidden agendas and the past (things left behind and the subconscious) and the Moon's south node, realizing of course that we are talking about monstrous qualities with the Chimæra and not the higher aspects of the symbolism. So, with this understanding of Sagittarius and what is actually the task before each of us at this point in the world's history, we need to turn our attention to the full moon, which is an eclipse this time, and involves the serpent, or dragon (Moon's south node). With Pluto in Capricorn marking the figurative menace of the goat's head of the Chimæra, what does this period and the two forthcoming eclipses hold for us? What does this period hold for us? I recently gave a talk on the lunar nodes as part of a forum on the subject. It was a fairly diverse presentation as far as the range of topics went, from the more scientific and esoteric perspective (me) to the cycles of life experience, the dynamics the nodes represent and a look at famous people. In all, it was an enjoyable and educational day, and those sorts of gatherings (we were all astrologers there) usually give us some sort of gem we can take away that helps one's practice or inspires one to further investigations. One of the topics of my discussion on the nodes was a look at eclipses, for eclipses always involve the lunar nodes, since the node is the place on the zodiac where the Moon's orbit crosses that of the Sun. It is thus the only place where a lunar or solar eclipse can take place. The whole subject of the nodes set me to thinking about a great many other topics, however, as these musing are apt to do, and one of the concepts that came through very clearly to me is that the nodes have no influence of their own. The nodes are simply places where orbits cross – 'crossroads', if you will. Now, there is a loaded concept. In addition to the preceding, the other muse that caught my attention is that the Moon is said to be where life on our little planet originated. In short, the Moon is (or was) the 'mother of the Earth', and when the term of her life was finished, her life passed into this globe. In a way, we are collectively the reincarnation of the Moon. If you want the full story of that process and how we came to be, then for a bit of light reading some night pick up a copy of The Secret Doctrine by H.P. Blavatsky and browse through the pages. It might interest some of you to know that she was born in the Year of the Iron Rabbit, which is the upcoming Chinese Year, and passed on sixty years later in the same Chinese year sign. She was an exemplary Iron Rabbit, our HPB, but I digress a bit. The upshot of my thinking on the nodes is that they are representative of one's instinctual compulsions, which are subconscious, and which are the result of one's learned responses to experience and thus represent a link to the past—specifically with the maternal lineage. More than that, though, they show where one's bodies (the past, since any single body is the result of one's past actions and of karmic imprints) and one's life purpose intersect (the Sun's orbit representing the progress of the psyche through life). Thus, the nodes indicate where purpose and instinct mingle, the places where they are either in parallel or in contrast (contraparallel). Eclipses, then, are astrological events wherein psyche and instinct are blended (solar eclipses) or where they are contrasted (lunar eclipses). Further, they are very powerful events because not only are the Sun and Moon conjunct or opposed, they are also in aspect by parallel or contraparallel, respectively. To finish with the nodes, one could say that the Moon's orbit defines a type of purpose as well, that purpose indicating the evolution of the lunar vehicles, or the bodies of the persona—physical nature, emotions and lower or coarse mind. The general planetary aspects to the nodal points can and do indicate problems or gifts presented through the maternal lineage, as the work of Noel Tyl has shown, but more than that such planetary dynamics can and do represent one's past attitude toward one's very bodies and/or environment. Thus, with eclipses we are given an opportunity to address the relationship between the present purpose of one's life or incarnation (represented by the Sun) and one's subconscious patterning, as represented by the nodes. In general, my take on the matter is that lunar eclipses give opportunities for emotional healing and advancement/fulfilment/reckoning, while solar eclipses give opportunities for major shifts in life direction, i.e., the chance to see if our instincts and ideas about living are correct or not. We could say a lot more about the subject, but hopefully we get the idea. Let's have a look at the two upcoming eclipses. In part two of this article, Malvin Artley continues his exploration of the esoteric implications of the Full Moon in Gemini, the Sagittarius Solar Festival for 2010. He examines the two eclipses, the aspects and the degrees with a view to their political, personal and spiritual significance. Read part two of The 2010 Sagittarius Solar Festival at the Full Moon in Gemini.